INTO THE FRAY: My New Year Appeal to Caroline Glick — Rethink “The Israeli Solution”. INTO THE FRAY: My New Year Appeal to Caroline Glick — Rethink “The Israeli Solution”. Glick’s prescription for a “A One-State Plan for Peace in the Middle East” will jeopardize the Zionist enterprise no less than the two-state paradigm, which she rightly repudiates with great force and eloquence. “As far as we are concerned, Ahmad is a hero and a martyr” — Ali Mahameed at the funeral of his relative, Ahmed Muhammad Mahameed, the Israeli-Arab killed in a recent attempted terror attack, Ynetnews, Aug. 21, 2018. Events of the past weeks have highlighted the incipient disloyalty — or at least the evident passive lack of loyalty — of significant sectors of the Israeli-Arab population to Israel as the nation-state of the Jewish people, and a clear rejection of the fundamental precepts on which the State of Israel was founded. It also cast grave doubts on the feasibility — and advisability — of most of the currently touted “Right” -wing proposals for the extension of Israeli sovereignty over Judea-Samaria. Following the racist cacophony of the Israeli-Arabs in the wake of the legislation of the Nationality Bill in July, denying the Jewish people the right to a sovereign nation-state (despite the constitutional assurance of civil equality for non-Jewish minorities), a series of several other disturbing events took place. In the coastal Arab village of Jisr-al-Zarka, about 40 km south of Haifa, two incidents of assault on state symbols by local residents took place. The one involved shots being fired in early August on the police station in the village, recently established as part of a wider initiative to bolster enforcement of law and order in the largely lawless Arab sector. 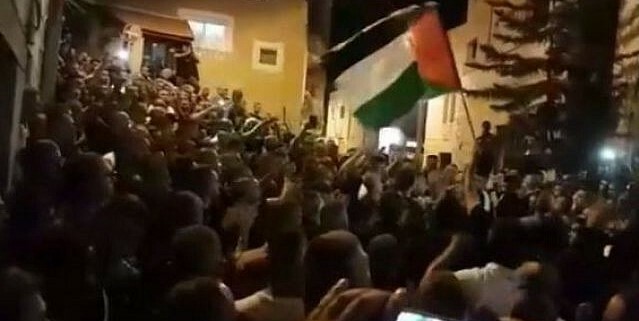 The other entailed an attempt, on August 15, by two other residents to remove the Israeli flag flying over the station. Two days later, Ahmed Muhammad Mahameed, a resident of another Israeli-Arab town, Umm-al-Fahm, attempted to stab an Israeli policeman in Jerusalem, and was shot dead. Despite the family’s undertaking to hold a small, unobtrusive burial, the funeral swiftly developed into a mass demonstration, with crowds brandishing Palestinian flags and loudly chanting anti-Israel slogans. Significantly, this public display of anti-Israeli sentiment was strongly reminiscent of the events that took place in Umm-al Fahm, just over a year ago, at the funerals of three residents of the town who were killed after they gunned down two Israeli police officers on the Temple Mount. Then, just a few days ago, it was reported that Arab Knesset members of the Joint List were colluding with members of the Palestinian delegation at the UN to initiate measures of censure against Israel. Clearly then, after over seven decades of living under Israeli sovereignty, after benefiting hugely from the civil equality afforded them (despite repeated instances of expressed affiliation with Israel’s most vehement foes), Israeli Arabs still find it difficult to accept — never mind, identify with — foundational fundamentals on which Israel was established — as the nation-state of the Jewish people. Despite having experienced the societal and economic advantages those fundamentals have brought them — particularly compared to the penury and violence in the surrounding states, founded on very different ones — they continue to demonstrate that they cannot abide the notion of Jewish sovereignty over the land. Thus, in the 2015 elections, well over 80% of the Arab electorate voted for the overtly anti-Zionist Joint List, a motley amalgam of political factions, ranging from radical communists to Muslim fundamentalists, whose only common ideological bond –indeed its very raison d’etre — is the rejection of the Jewish character of Israel. Indeed, its elected officials, arguably among those who have benefited most from the socio-political order, have been the most vehement in their overt support for Israel’s most virulent enemies. Thus, Azmi Bishara, founder of the Balad party, currently part of the Joint List, gave a speech in Umm al-Fahm in 2001 — as a Knesset member — deploring Israel’s victory in the Six-Day War. Shortly after the 2006 Second Lebanon War, Bihsara arrived again in Syria and together with other members of his Balad party (including Jamal Zahalka , currently head of Balad) visited Lebanon, where they met the Lebanese Prime Minister Fuad Saniora. The Israeli Knesset members expressed their support for Hezbollah, praising the terror organization’s military action against Israel, informing the Lebanese PM that it had “lifted the spirit of the Arab people [sic]”. It was thus not totally unexpected to hear that in 2007, Bishara had fled the country under suspicion of aiding Hezbollah during the Second Lebanon War, later resigning his seat in the Knesset. Then, of course, there is Haneen Zoubi, who chose to participate in the infamous flotilla initiated by the terrorist-affiliated jihadist Turkish organization, IHH on the Turkish vessel Mavi Marmara, endeavoring to break the security cordon imposed on Gaza. 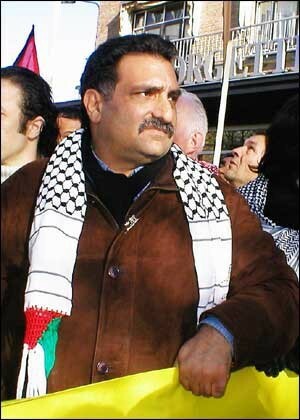 Indeed, Zouabi, another Balad member, and currently an MK of the Joint List, is on record proclaiming that the very concept of a Jewish state was “inherently racist” and expressing support for Iran’s nuclear program, which she endorsed as necessary to balance Israel’s military power, which she identified as the major regional danger. Another Joint List MK, Basel Ghattas, was caught, in late 2016, smuggling cell phones and SIM cards to convicted terrorists in an Israeli prison under cover of his parliamentary immunity. 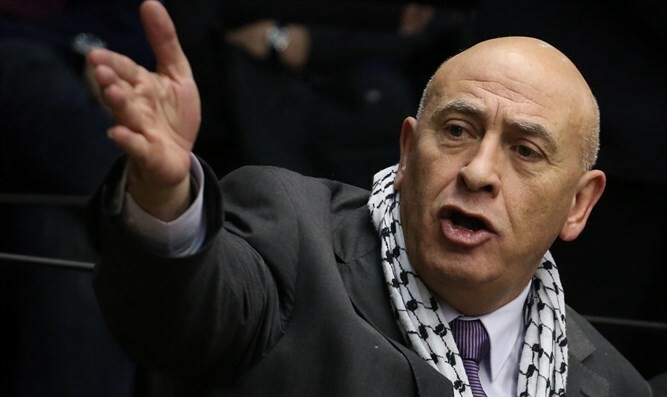 Ghattas resigned his Knesset seat and is currently serving a prison sentence for aiding a terrorist organization and a string of other offences. Just months ago, Jamal Zahalka , who succeed Bishara as head of Balad, (today also a Joint List MK), declared that he “would rather die than sing the Israeli national anthem” — i.e. rather die than sing the anthem of the country in whose parliament he serves. As for the national flag he declared: “It’s a lot worse than a rag”. Last but not least, there is Ahmad Tibi, who before being elected as an MK, served as a political advisor to the arch-terrorist, Yasser Arafat. Tibi, today also a Joint List MK, is a declared anti-Zionist who opposes Israel’s character as a Jewish state, claiming that its self-definition as Jewish is racist. He rejects, across the board, elements that reflect the Jewish nature of Israel — including the Law of Return, the flag, and the national anthem. Tibi, as an Israeli legislator, opposes the recruitment of Arab citizens of Israel into the IDF while supporting the Palestinian right of return, calling it a prerequisite for reconciliation. The reason that I catalogue these instances is to underscore the political sentiments of the Israeli-Arabs as a collective, reflected in the parties and the individuals they vote for. After decades of life as fully enfranchised citizens under Israeli sovereignty, they — and certainly their elected representatives — resist and resent the Jewish nature of the state, in which they live and which has bestowed on them such far-reaching societal benefits — notwithstanding their clear sentiments of affiliation with Israel’s implacable foes. The fact that incipient enmity exists — indeed, persists — despite the relative social and material advantages the Israeli-Arabs enjoy relative to those of their kinfolk across Israel’s borders, should serve as an incandescent red light to well-meaning proponents of extending Israeli sovereignty over Judea-Samaria together with the Arab population resident there. 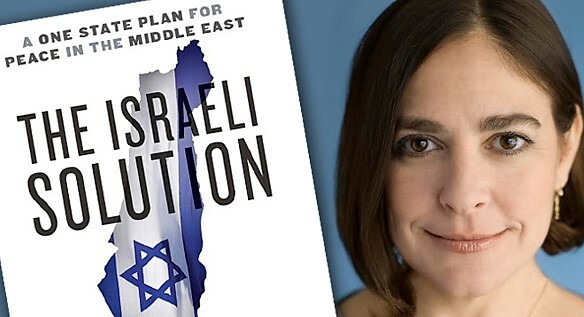 One of the best known proposals — arguably, the best known — is that of the prominent columnist, Caroline Glick, which she elaborates on in her 2014 book, The Israeli Solution: A One-State Plan for Peace in the Middle East. To briefly summarize the gist of her proposal, in her own words, Glick writes: The mechanics of the policy are fairly straightforward. Israel will apply its laws to Judea and Samaria and govern the areas as normal parts of Israel…Contingent on security concerns…Palestinians will have the right to travel and live anywhere they wish within Israeli territory…Palestinians will have the same legal and civil rights as the rest of the residents and citizens of Israel… Those that receive Israeli citizenship in accordance with Israel’s Citizenship Law will also be allowed to vote in national elections for the Knesset. Glick bases her proposal on “alternative” demographic assessments that the Muslim population in Judea-Samaria is grossly inflated. But even granting that this is correct, her proposal involves doubling the current number of Muslims in Israel’s permanent population. Moreover, as Glick acknowledges herself, this additional population has for generations, been “fed…a steady diet of jihadist and Nazi-style anti-Semitism” by means of the “Palestinian school system and media and appointed imams in mosques”. Glick appears to be alive to the problematic potential this entails, writing: … suddenly reducing the Jewish majority from 75 percent to 66 percent will undoubtedly have unforeseeable consequences on Israeli politics.” However, I fear that the consequences may well be entirely foreseeable and equally detrimental. This of course stands in stark contrast to the evidence of recent weeks among Israeli-Arabs, which offers persuasive proof that despite decades of assertion of central authority” this has done little, if anything, “to neutralize …anti-Israel animus”. Indeed, one can only wonder with grave concern just how such anti-Israel animus might be spurred by doubling the Muslim population, fed for generations with “a steady diet of jihadist and Nazi-style anti-Semitism”. After all, even if the optimistic demographic assessments are correct, her prescription will still entail a Muslim minority of 35–40%. This, in itself, will have far reaching implications both for budget allocations and the socio-economic fabric of the country. Clearly, with a recalcitrant minority of this size, including many of whom (as Glick herself acknowledges) have been taught for decades to hate Jews and who vehemently reject the Jewish character of the state, its symbols, calendar and conduct of public life, it will be impossible to forge a coherent and cohesive society. Rather, the result is likely to be pervasive inter-ethnic strife, even violence, and the Lebanonization of Israeli society. Moreover, as I have pointed out elsewhere, the addition of the Arab residents of Judea-Samaria to Israel’s permanent population will compel a massive diversion of resources to reduce, in some measure, the yawning gaps in the socio-economic conditions that exist between the Muslim population beyond the pre-1967 lines and the rest of the Israel. This will inevitably siphon off funds currently utilized for enhancing infrastructure, welfare, education and so on, dramatically lowering the standard and quality of life for the existing citizenry. The combination of deteriorating economic conditions and increasing interethnic friction will give rise to a detrimental demographic dynamic — making Israel an increasingly less attractive destination for Jews abroad and a decreasingly appealing place of residence for the Jewish population in Israel. The almost certain result will be diminished Aliyah (Jewish immigration) and accelerated Yeridah (Jewish emigration), eroding the Jewish numerical majority and imperiling the Zionist electoral majority — especially in the light of the recent behavior of Left wing factions in the wake of the “Nationality Bill”. Accordingly, the prescription advanced by Glick in calling for a “A One-State Plan for Peace in the Middle East” entailing extension of Israeli sovereignty over Judea-Samaria — including the Arab population — will jeopardize the Zionist enterprise no less — arguably more so — than the two-state paradigm, which she rightly repudiates with great force and eloquence. As the year draws to a close I would urge her to rethink the positions she has hitherto adopted and consider charting a different course. So, while I completely concur with her that Israeli sovereignty must be extended from the “River to the Sea,” I call on her to endorse a vigorous program of incentivized emigration (a.k.a. Evacuation — Compensation) for the Arab residents in Judea-Samaria as the only non-“kinetic” policy prescription that can adequately address Israel’s geographic imperative and its demographic one — if it is to endure as the nation state of the Jewish people. After all, the principle of “Evacuation — Compensation” is often advanced for the removal of Jewish residents in Judea-Samaria — to facilitate the establishment of yet another homophobic, misogynistic Muslim-majority tyranny (a.k.a. a Palestinian state). So why not rather advance the same principle for the evacuation-compensation of the Arab residents of Judea-Samaria–-to prevent the establishment of such a homophobic, misogynistic tyranny…?? ?